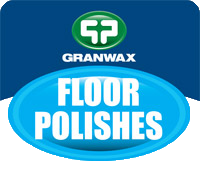 Granwax has developed a range of floor polishes that provide a durable and hard wearing, yet attractive finish for a variety of different surfaces, and when safety is of the utmost importance, Safestep Floor Polish offers excellent traction properties. 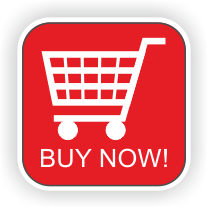 Applicator frames, handles, pads and dishes are also available. 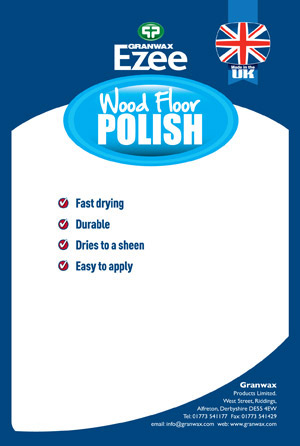 Ezee Wood Floor Polish is a semi-buffable polish, which offers a good durable finish that combats scuff marks and protects wood floors quickly and simply. It is ideal for use on all types of wood floors, including pre-finished flooring systems (should not be used on melamine). Formulated with safety in mind. 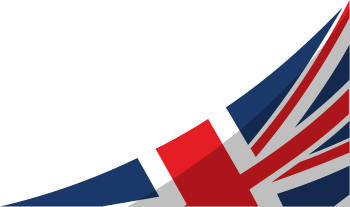 Anti-slip, non-dusting and fully burnishable. 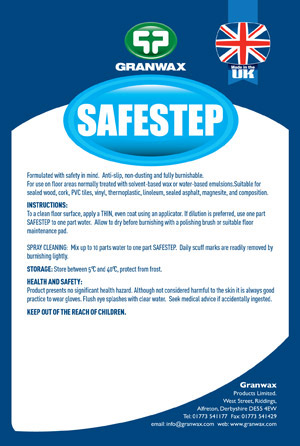 For use on floor areas normally treated with solvent-based wax or water-based emulsions. Suitable for sealed wood, cork, PVC tiles, vinyl, thermoplastic, linoleum, sealed asphalt, magnesite, and composition. Tufsheen is a high solids metallised emulsion that offers an extremely durable finish and lasting shine with a high degree of resistance to soiling, water spillage and neutral detergents. Ideal for use on wood, Granwood, cork, asphalt and concrete (these types of floors must be sealed/coated). Also thermoplastic, linoleum and vinyl. Should not be applied to floors used for sporting activities. Granshield is a fast drying emulsion with a bright tough finish. Offers maximum protection, gives a more durable finish and is resistant to neutral detergents.